Imagine millions of iPhones and iPads. Imagine them all checking and finding out that there’s a new version of iOS available. Now imagine them all trying to download the multi-gigabyte update simultaneously. Even with highly distributed file servers and all the magic of modern caching systems in the pipeline, that’s still a staggering amount of data. Oh, and the number isn’t millions, because as Tim Cook, CEO of Apple, shared during his recent talk, there are now two billion iPhones. 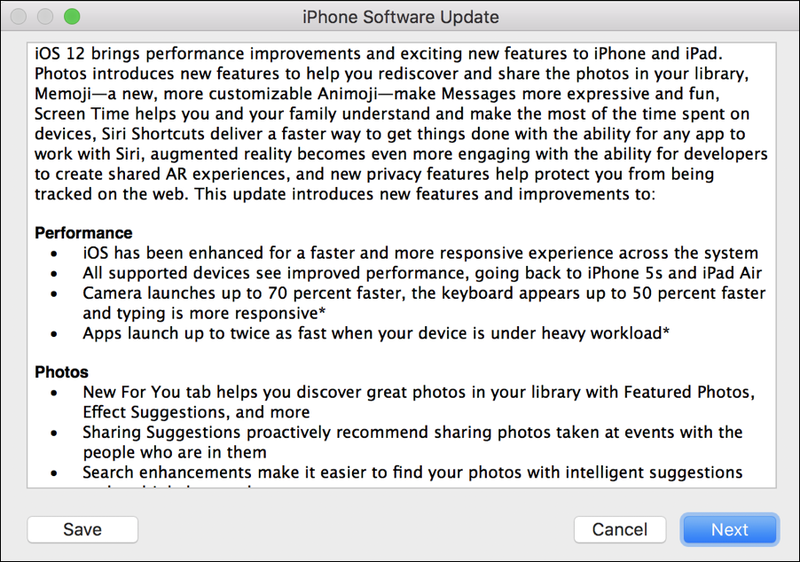 So yeah, that’s a lotta demand for that software update the first few days after it’s released! Fortunately there are two ways you can update the firmware on your iOS devices; on the device itself or through the iTunes program. It’s the latter solution that’s far smarter, faster (sometimes) and definitely more reliable. Best of all, your phone isn’t locked up or unavailable except for the very last phase of the process. Let me step you through how I updated my iPhone X on iOS 12 launch day, even with millions of other iPhone users vying for bandwidth! If you still see iOS11 as the latest, click on the “Check for Update” button and then you’ll be back to what’s shown above, ready to proceed. So let’s proceed! Click on the “Update” button. If you really want to make this as low impact as possible, just click on “Download Only” and plan on coming back later (perhaps after lunch or a coffee break) to do the actual update. If you don’t mind having your phone stay plugged into your computer, choose the default option of “Download and Update“. It all looks good. You probably don’t need to Save it (but you can if you want!). Click on “Next” to proceed. And… it’s time to download. This part can take a while so it’s entirely safe and okay if you want to just unplug your phone and get on with another task (coffee? did we already mention coffee?). It’s also worth noting that the estimated time remaining is going to go all over the place, sometimes looking like you’re almost done and other times suddenly predicting hours remain. That’s based on download vs time, so if it gets a lot of “pipeline” it’ll assume everything’s glorious. If things clog up, however, it’ll suggest many hours remain. Eventually, though, you will get the entire 3.34GB iOS 12 software updater package downloaded onto your computer. Click on “Update” to proceed. Note, if you did unplug your phone, just plug it in after the download’s complete and the above window will pop up so you can proceed. Easy enough. Odds are good that the backup won’t be needed, so it probably doesn’t matter if there’s sensitive data stored in it or not, but why would you want that information just sitting on your computer for someone else to analyze? Click “Encrypt Backups” to proceed. Now the fun all happens within the tiny iTunes status window near the top. The “verifying update” message is good news: you’re done! Huzzah! You’re now running iOS12 on your iPhone. That wasn’t too bad, was it? Pro Tip: Now that you’re running iOS 12, do check out all our iPhone help pages here on the site! We have lots of useful tutorials.